Mold exposure and mold toxicity are very serious issues that can be effectively diagnosed and successfully treated by the experienced professionals at COEM. Many studies link exposure to damp or moldy indoor conditions to increased incidence and/or severity of respiratory problems such as asthma, wheezing and rhinosinusitis and even life-threatening systemic infections in immunocompromised persons. Stachybotrys, also known as toxic black mold, produces trichothecenes and other mycotoxins,which can inhibit protein synthesis and induce hemorrhaging disorders. Indoor mold exposure can alter immunological factors and produce allergic reactions. Several studies have indicated that indoor mold exposure can alter brain blood flow, autonomic nerve function, and brain waves, and worsen concentration, attention, balance and memory. Health officials are increasingly concerned about the dangers of mold in our homes and offices. It is understood that mold (fungi) is capable of causing allergy, infection, and even toxicity in humans. Doctors who are members of the American Academy of Environmental Medicine have known for some time that specific molds, in sufficient concentration over a sustained period of time, are potentially detrimental to our health. These doctors have become expert in the diagnosis and treatment of mold-induced medical problems. The physicians at COEM are world class doctors having experience diagnosing mold poisoning and its associated conditions. This includes proper documentation through biomarkers of exposure and effect supported by comprehensive lab testing that is very specific for mold mycotoxins. Molds have been present for billions of years and comprise 25 percent of the earth’s biomass. They are everywhere! Most of these molds are harmless and don’t affect our health. But indoor fungi such as aspergillus, penicillium, stachybotrys, cladosporium, and alternaria are capable of creating health issues when at sufficient levels. Many molds reproduce by making spores. When the spores come into contact with a moist ‘food’ source, they germinate and commence the production of a branching network of cells called hyphae. The hyphae secrete mycotoxins and digestive enzymes that work on cellulose in our house walls. Moisture is a key requirement. What are some of the health problems mold can cause? In a review paper entitled “Adverse Health Effects of Indoor Molds,” the authors cite the study by Rea et al of 150 heavily indoor mold-exposed patients, which found similar health problems in similar percentages as Lieberman’s study. The Mayo Clinic noted that 96% of chronic sinusitis patients were infected with fungus. This fact is alarming since antibiotics are repeatedly given to treat the bacteria, but anti-fungals are not given to treat the fungus. Lebowitz et al reported that 56 percent of 45 patients having sinus surgery had positive fungi cultures. How should a patient be evaluated for a mold-related symptom? Environmental sampling can be performed to check for spores and mycotoxins. Placing agar plated mold dishes in suspected moldy environments can yield counts of colony forming units. One study implies more than four colonies could be a problem, especially for those with recurrent sinusitis. Calling in a mold inspector to do a thorough evaluation and written report of their findings is important. If litigation is involved it is wise to bring in a CIH, Certified Industrial Hygienist, who is qualified by training to determine the presence and extent of mold over growth. Treatment is individualized and specific to the findings of a complete evaluation. Treatment modalities can include: anti-fungal medications, allergy/immunotherapy, treatments for sinusitis, nutritional/herbal support, intravenous vitamin and mineral supplementation, and/or biodetoxification. Recommendations will be made as to avoidance of the contaminated environment entirely. If that is not an option then proper professional remediation of affected areas is required. The physicians at COEM have seen thousands of cases of mold exposure and its toxic effects. They are experienced in the accurate diagnosis and treatment of mold injuries and can help you to detoxify your body of mold mycotoxins. Please call our office to speak to the New Patient Coordinator, Krystal: (843) 572-1600. See the article, The Effects of Toxic Molds on Personality and Brain Functioning, by a Licensed Neuropsychologist, for additional information as well. Please see the article in this issue, “Assessment of Mold in Indoor Environments,” by a Certified Indoor Environmental Consultant (CIEC). In addition, mold plates for household sampling of molds are available for our patients at The Center. We can also make referrals for mold inspectors and Certified Industrial Hygienists to assist you in confirming the extent of mold damage in your residence or business. 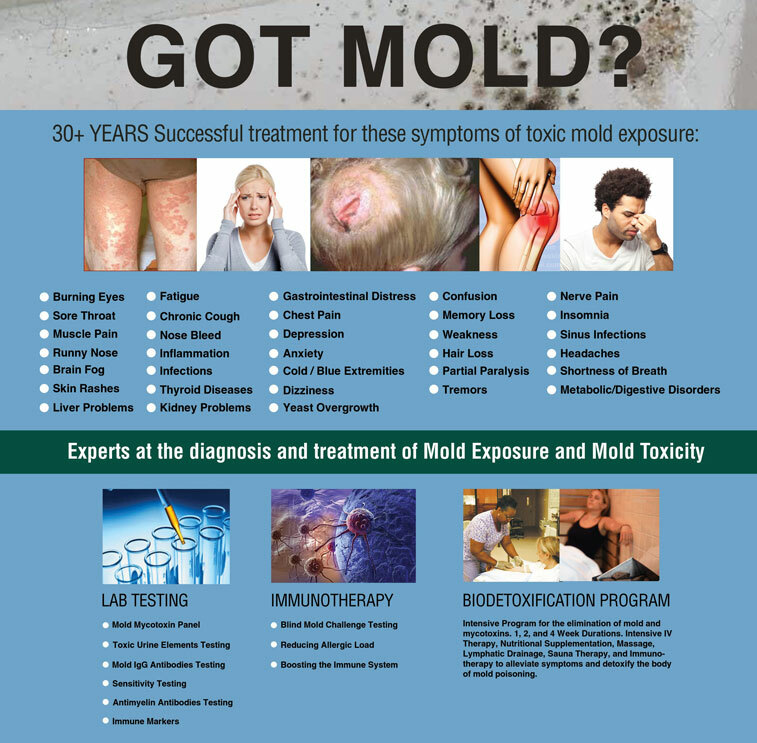 Curtis L, Lieberman A, Stark M, Rea M, Vetter M. Adverse health effects of indoor molds. Journal of Nutritional and Environmental Medicine (Sept 2004) 14(3) 261-274. Lieberman, A. Explosion of mold cases in homes, workplaces and occupational medicine practices. Presented at the 21st Annual Symposium on Man and His Environment in Health and Disease, Dallas, Texas, 19-22 June 2003. Liebowitz, R, Waltzman M, Jacobs J, Pearlman A, Tierro P. Isolation of fungi by standard laboratory methods in patients with chornic rhinosinusitis. Laryngoscope 2002:112(12):2189-91. Vodjani A, Campbell A, Kashanian A, Vodjani E. Antibodies against molds and mycotoxins following exposure to toxigenic fungi in water-damaged building. Archives of Environmental Health 2003; 58(^):324-36. Vodjani, A, Thrasher J. Madison M, Gray M, Heuser G, Campbell A. Antibodies to molds and satratoxin individuals in a water-damaged building. Archives of Environmental Health 2003; 58(7)421-32. Vodjani, A. Health effects and immunotoxicology of toxigenic molds and mycotoxins. Presented at the 21st International Symposium of Man and His Environment in Health and Disease, Dallas, Texas, 20 June 2003.